‘A Fragile Beauty: Art on the Blackdown Hills 1909 to 1925’ captures the beauty of this Somerset and Devon borderland in a period when the First World War was changing English society forever. The Camden Town Group, led by Walter Sickert, was named after the London district where many of the artists lived and worked. 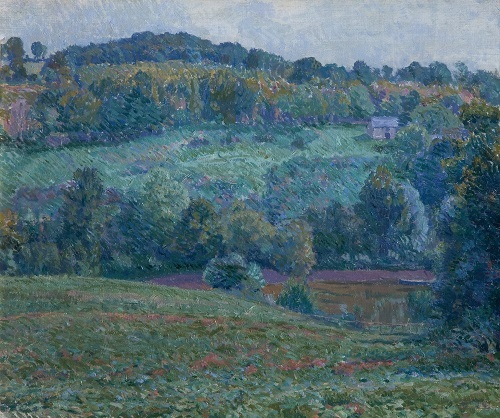 Initially they painted contemporary urban life, but later they were drawn to the countryside, especially the Blackdown Hills. Inspired by the example of the impressionists and post-impressionists, artists such as Spencer Gore, Charles Ginner and Robert Bevan created Somerset and Devon landscape paintings of great freshness and immediacy. “They came to Applehayes, Clayhidon, as the guests of Harold Harrison, an estate owner and amateur artist,” Tom Mayberry, Chief Executive of the South West Heritage Trust, explained. ‘A Fragile Beauty’ is the first major exhibition at the Museum of Somerset to rely entirely on loans from other museums and from private collectors. 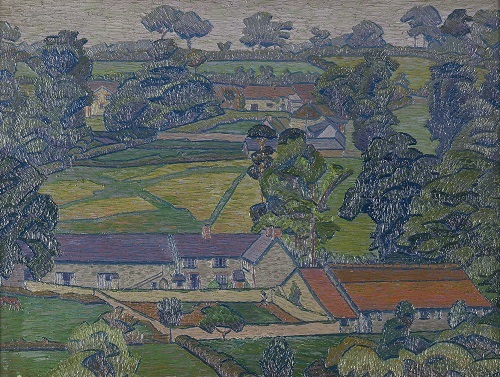 Loans include Spencer Gore’s ‘Applehayes’ from the Ulster Museum, and Charles Ginner’s ‘Landscape with Farmhouse’ from Manchester Art Gallery. The exhibition also includes works from private collections that have rarely been seen in public. The museum has worked with the fine art auctioneers, Lawrences of Crewkerne, who, together with private donors, and the Blackdown Hills Area of Outstanding Beauty (AONB) have very generously sponsored and supported the exhibition. A varied public programme of associated events is being delivered, including opportunities to enjoy the specially protected landscape of Blackdown Hills AONB as it is today. ‘A Fragile Beauty’ has been created in partnership with the Somerset-based curators and art historians Denys Wilcox and Richard Emeny. The exhibition runs from 25 March to 8 July. A talk by Richard Kay, art historian and Director of Pictures at Lawrences, Crewkerne, on the life of Walter Sickert. £15 per person with cheese and wine. Booking required via the Museum 01823 255088. A free family fun day based around the history, heritage and archaeology of the Blackdown Hills – the landscape which inspired the Camden Town artists. Linda Bennett, Blackdown Hills AONB Manager, will give a talk on the landscape of the Blackdown Hills and why it’s special. £5 per person. Explore the landscapes and buildings of the Blackdown Hills which feature in the paintings of Camden Town Group. Local naturalist, Gavin Saunders, will lead a walk through the valley around Applehayes and Ringdown in Clayhidon to look for echoes of the artists’ work. Suggested donation £5 per person. Booking required via the AONB 01823 680 681. The South West Heritage Trust is bringing an array of internationally important art to the county in 2017. As well as discovering great art works by the Camden Town Group, visitors to the Museum of Somerset will be able explore Hans Schwarz’s story of exile and the home he found in Somerset. There will also be the opportunity to see an extraordinary portrait of King Henry VII, dated 1505, which is the earliest royal portrait taken from life in the collections of the National Portrait Gallery.